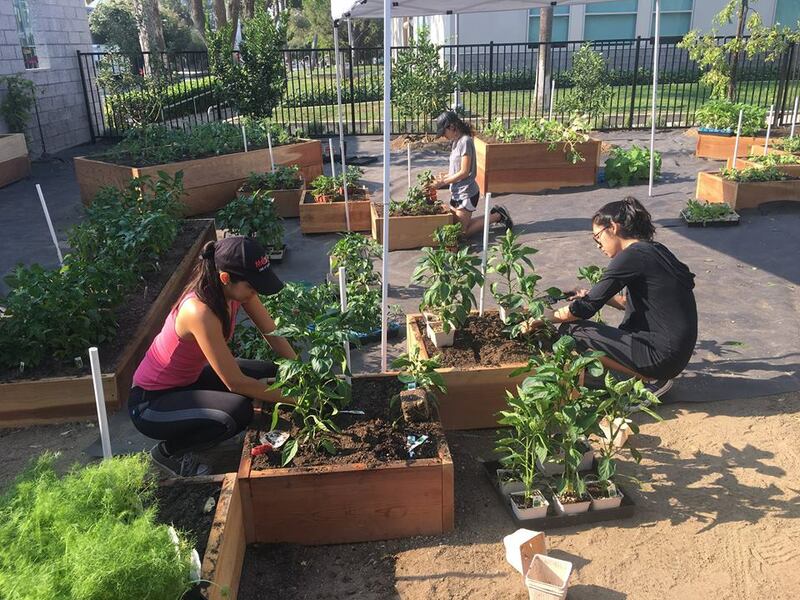 As part of Champions for Change, CSUN faculty and students will be working throughout the Canoga Park area to help to establish community gardens. Photo courtesy of the Marilyn Magaram Center for Food Science, Nutrition and Dietetics. California State University, Northridge has been awarded $880,000 from the Los Angeles County Department of Public Health to support a project to reduce obesity rates among low-income Supplemental Nutrition Assistance Program-Education eligible populations in Canoga Park. The grant, made possible with support from the California Department of Public Health and the U.S. Department of Agriculture, supports the Champions for Change – Healthy Communities Initiative, which aims to reduce obesity by providing nutrition education, promoting physical activity and working to create healthier environments for low-income individuals and families where they live, learn, work, play, pray and shop. “We will be working with local community groups, including schools, to build the foundation for ongoing efforts to combat obesity in the area through nutrition education, promoting more physical activity and create healthier environments, including community gardens,” said Annette Besnilian, executive director of CSUN’s Marilyn Magaram Center for Food Science, Nutrition and Dietetics. The center is partnering with CSUN’s Institute for Community Health and Wellbeing’s Neighborhood Partners in Action project in Canoga Park. Key efforts under the initiative include teaching fundamental skills such as cooking, reading food labels, shopping on a budget, growing fruits and vegetables, and introducing low-cost and fun ways to be physically active. In addition, the initiative will identify resources throughout the county to help improve access to healthier foods and increase opportunities to be physically active in a variety of settings, including childcare centers, schools, faith-based organizations, corner stores, parks, worksites and cities. As part of the initiative, CSUN faculty and students will be working throughout the Canoga Park area, helping to establish community gardens where fruits and vegetables will be grown at about 13 different sites, as well as holding education sessions at local schools and community groups about making healthy lifestyle choices. The Magaram Center is located in CSUN’s Department of Family and Consumer Sciences which is housed in the College of Health and Human Development. “The Champions for Change project is a great reflection what can happen when the students and faculty on the CSUN campus partner with community organizations to bring about social change,” said sociology professor David Boyns, director of CSUN’s Institute for Community Health and Wellbeing. Boyns and theater professor Doug Kaback, who heads the Neighborhood Partners in Action project, are working with the Magaram Center on the project. According to the “LA County: A Cities and Communities Health” report, obesity-related chronic illnesses continue to rank among the top 10 leading causes of premature death, including heart disease, stroke and diabetes. While the obesity epidemic continues to impact nearly all population groups, about 18.2 percent of children and 18.8 percent of adults in the LA City Council District 3 are obese.